PERSONNEL: Cubmaster and 1 Scout for each badge or achievement being presented. PROPS: 1 Newspaper for each Scout. Cubmaster: Well, looks like we have some new Bears among us! (call new Bears and parents forward. Have parents present badges to their boys. Again, present any arrow points to current Bears at this time. Cub # 4: “Special edition! Webelos spotted! Cubmaster: Webelos! What’s a Webelos? This advancement ceremony is for all levels of Cub Scout badges (Tiger, Wolf, Bear, and Webelos), the Arrow Points for Wolf and Bear, and Webelos Activity Badges. It does not include the Arrow of Light award as this is a very special award that should be handled with a separate ceremony. This ceremony can be tailored to the number and types of awards you pack is presenting, by leaving out the award segments that are not needed. Setup: A “news table” is set up off to the side of the stage. It can be decorated with a radio station logo and an old-fashioned mike – fancy things up as much as you want. The awards presenter (Cubmaster) has a walk-around microphone with the radio station logo on it. Announcer: We interrupt this Pack Meeting to bring you this late-breaking story. This is your news anchor, (name), with an important News Flash! (Radio Station name – WCUB, perhaps) has been following the progress of the Cub Scouts in Pack _____ over the past month. As reported by their Den Leaders, many of these Cubs have been working hard on their advancements and have earned special badges for their hard work. With more on this story, we take you to our roving reporter, Cubmaster (name). Cubmaster: Thanks, _____. That’s right! We do have some Cub Scouts tonight who have worked hard and have earned advancements. I have been talking with the Den Leaders for the Tiger Cubs and they have reported that ___ Tiger Cubs have earned their Tiger rank. Will the following Tigers and their Adult Partners please come forward? Cubmaster: I have also talked with the Den Leaders of Den _____ and Den _____ and learned that the following Cub Scouts have been working on the Bobcat rank. Would (names) and their parents please come forward? Announcer: Now, Cubmaster _____ as I understand it, in order for the Cub Scouts to earn the Bobcat badge, they must learn about Cub Scouting. They have to know the Cub Scout Promise and the Law of the Pack. They also have to learn the Cub Scout sign, Salute, and Handshake; the Cub Scout Motto and the Webelos Code. Is that correct? Cubmaster: That’s right, _____. And, with their parents, they also study “being safe” so that they know what to do to protect themselves if someone is bothering them. Announcer: And the Cub Scouts here tonight have done all of that? Wow! For our viewing audience, could we get the Bobcat’s to give us an example of what they’ve learned? Maybe they could repeat the Cub Scout Promise with you. Cubmaster: Sure! [Instruct the Cubs to repeat the Promise] One other important note for your listeners. A Cubmaster does not give the badges to the Cub Scouts because it is the parents who have worked with the Cubs to earn the badge. So I will ask the parents to please pin the Bobcat badge on tonight. (Parents awards Bobcats and the Cubmaster congratulates them and directs them back to their seats.) Back to you, _____. Announcer: Thanks Cubmaster _____. But I also understand that the advancement trail includes this thing called Wolf. Does this have anything to do with the Boy Who Cried Wolf? Cubmaster: Yes and No! Yes the advancement trail does include the Wolf rank and, no, it has nothing to do with the boy who cried wolf. Announcer: So these Wolf Scouts . . .my report tells me they have to complete 12 Achievements for everything from doing physical fitness activities to learning about the neighborhood and, again, being safe at home. Do we have that right? Cubmaster: Yes, _____. And tonight we have ___ Cub Scouts. who have done just that! Please come forward with your parents. Announcer: It says in my news report that there are Bears on the prowl. Is this something we should be worried about, Cubmaster _____? Cubmaster : No, that means we can award the Bear badge tonight. Cub Scouts in the third grade work very hard to complete 12 Achievements. . .
Announcer: I thought they did that for the Wolf badge? Cubmaster: A different set of achievements, _____. These are from the Bear book and cover the areas of God, Country, Family, and Self. Sometimes it involves learning about tall Tales and sometimes it’s about cooking in the kitchen, but it’s up to the Cub Scouts to choose the 12 achievements. Tonight we will award the Bear badge to ___ Cubs if they and their parents would please come forward. Announcer: Cubmaster _____, I think the natives are getting restless. My report says there are some arrows flying all over the place. Have you seen any signs of this? Cubmaster: I think there’s a mistake in you report. The Cub Scouts earn Arrow Points after they have earned their wolf and Bear badges. And tonight some of the Cub Scouts, etc. are being awarded their Arrow Points. An Arrow Point is awarded for every ten electives the wolf or Bear completes – a gold Arrow Point for the first ten and silver arrow Points for each additional ten. Present Arrow Points and give handshakes. The boys return to the audience as the awards are presented. Announcer: Now we will move on to the Activity Badge presentation. Says here in the news bulletin that they are awarded to “Webelos.” What’s that, some long-ago extinct animal like the dinosaur? Cubmaster: No, the Webelos is a fourth-or-fifth-grade Cub Scout who is preparing to become a Boy Scout. The word comes from the letters in “WE’ll BE LOyal Scouts” and it’s also the name of the Cub Scout tribe that includes all Cub Scouts in the BSA, led by their chief, Akela. Announcer: Great! So these Activity Badges, what’s the scoop on them? Our report is a little sketchy. It says the Webelos can earn any of 20 different ones – almost sounds like Boy Scout merit badges. Cubmaster: That’s right. The Activity Badges are very similar to Boy Scout merit badges and the Webelos get to choose – with their Den Leader – which ones they will earn. Tonight, our Webelos Scouts will receive the (list Activity badges they will receive)– for having completed the requirements over the past month. Would the Webelos Scouts, Den Leader and parents please come forward? Give a talk about what ever badges are being presented, Use Webelos to demonstrate what they have learned. The Den Leaders are going to present the badges tonight. Den Leaders hand out badges, congratulating the boys and parents. The Cubmaster congratulates them and asks them to please be seated. Announcer: Thanks, Cubmaster _____. For this last segment of our special report, the Webelos badge is awarded. How does a Cub Scout earn that? Cubmaster: Well, the Webelos award is earned by completing eight requirements. Some have to do with earning Activity Badges – specific ones, others have to do with participating in the Webelos program as an active Scout, and the rest are about learning to be a Boy Scout. Tonight, Webelos Scouts – (list the names and ask them to come forward with parents and Den Leaders) – will be awarded the Webelos badge for completing the requirements. It’s not an easy award to earn and not all Webelos Scouts earn it, so this is really pretty special. It shows us that they are serious about Scouting and willing to work hard. As with the Activity Badges, the Webelos goes through his Den Leader to earn the Webelos Badge. When the Den Leader agrees the Webelos is ready, we ask the leader to award the badge. Cubmaster congratulates them and asks them to return to their seats. Cubmaster: One final word, _____. After the Webelos has earned his Webelos badge, he works toward his Arrow of Light Award – the highest award a Cub Scout can ever earn and an award he even wears on his Boy Scout uniform. So we raise the challenge to the Webelos receiving the Webelos badge tonight. Keep up the good work and let’s earn the arrow of Light Award! EXTRA! EXTRA! READ ALL ABOUT IT! THESE BOYS SURE DID GREAT! Announcer: Well that concludes our special awards broadcast for tonight. Stay tuned for more important breaking news, as it happens. In the meantime, I’m your anchor, _____ _____. Thank you, and good night! Use the newspaper shown (or make your own) to present the award(s). Simply tape the award where it says, “tape award here” and present the whole thing to the boy. He could then say that tonight he is there to interview a young man who has accomplished a great feat. He then calls up the boy(s) and his parent(s) and leader(s). Once everyone is up front he then commences to interview them. To parents- Did he work hard at home to earn this? Has he been doing good deeds? Is there something you’d like to say to him? To Leader- Is there a funny(inspirational) story related to this? Do you think he’ll be getting his Eagle? To Boy- What did you do to get this? It’s a good idea to let the adults know ahead of time what you’ll be asking, and if the boy seems to be embarrassed, or is having a hard time up front, don’t dwell on him. 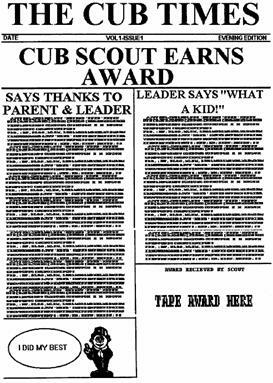 Props: A newspaper for each boy – on the newspaper, tape the Cub Scout’s name on top of the headline, making a new headline. Cubmaster comes out wearing a 30's style hat with the brim turned up and a "press card" tucked into the hatband. Den Leader: Yes, you can interview me. Cubmaster: Tell me, what you have been doing this month. Den Leader: Well, we have been learning about newspapers. We made our own paper. Cubmaster: Oh, really! What else have you been doing? Den Leader: All the boys in the den completed requirements for the badge. Cubmaster: Super, will step up with their parents and receive their awards? "YLIMAF ELOHW EHT ROF -- GNITUOCS BUC. : (Cub Scouting—for the whole family, written backwards. The Cubmaster then calls forward those boys receiving their Bobcat awards and their parents. Ask the boys if they can read the code. When they have figured it out, then speak briefly on the parents' role in the program. Award Bobcat badge and certificates. For awarding Wolf and Bear badges, Arrow points, and Webelos awards have the Cubmaster act as emcee of an awards show, announcing names of the advancing boys and explaining their achievements, while the boys and their parents receive the badge from a pack committee member. Place each boy’s awards in an envelope. Write the boy’s name on the envelope containing his awards in a secret code (mixed-up order). As each boy is called forward to receive his award, he must figure out which envelope is his. Then present the award to his parents to present to him. Use a secret code in the ceremony. Names of the boys receiving awards or their rank may be written in secret code. The Pack Advancement Chair may be a “radio announcer” who calls the boys up before the Cubmaster with appropriate announcement and calls for applause. Setting: TV News Anchor desk (table) with Anchorman seated. Camera can be added off on the side taping the presentation. That’s all the news we have for you in tonight’s program. Thank you for tuning in. This is T.L.Meanething signing off for stations (Pack Number), CUB Evening News.